Did Mitt Romney Write His Columbus Dispatch Endorsement? Wow! 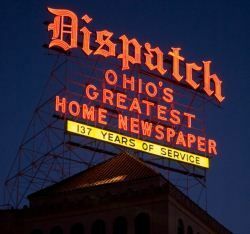 The Columbus (Ohio) Dispatch hit all the GOP talking points in their recent editorial endorsing Mitt Romney for President. What kind of shocked me was the inclusion the subtly racist one that says ‘We gave the guy a chance so it is okay to vote him out of office’ that comes from the ad the Republican National Committee is running on the local Dispatch owned TV station now. I wonder if the Romney campaign and/or the RNC wrote the editorial because rational people know all the talking points have been rebutted multiple times. This entry was posted in Columbus, Politics and tagged 2012 US Presidential Election, Columbus Dispatch, conservative bias, endorsement, GOP Fail, IOKIYAR, irrational, Mitt Romney, political bias, President Barack Obama on October 22, 2012 by Doug.